Back with a bang in February, welcoming you all onto the floor for a night of dancing. 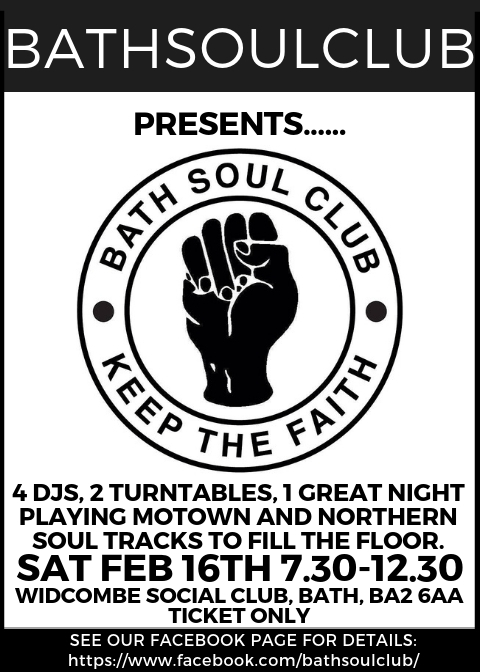 Bath Soul Club return to Widcombe Social Club with 4 more DJs bringing their choice selections to keep you entertained, impressed and busy all night. The DJ's will be spinning Northern Soul and Motown upstairs between 7.30pm-12.30am and downstairs we will also have a resident DJ's, Tim and Louie playing their mix of Ska, Mod, Northern and R&B downstairs between 7-10pm. Look forward to seeing you at the door and on the floor!